Many people remember their first dishwashers – after years of apartments with only a sink, sponges and a dishrack, they finally have one of the kitchen's best luxuries! But chances are, the dishwasher you started out with isn't all that efficient or effective compared to today's top models. 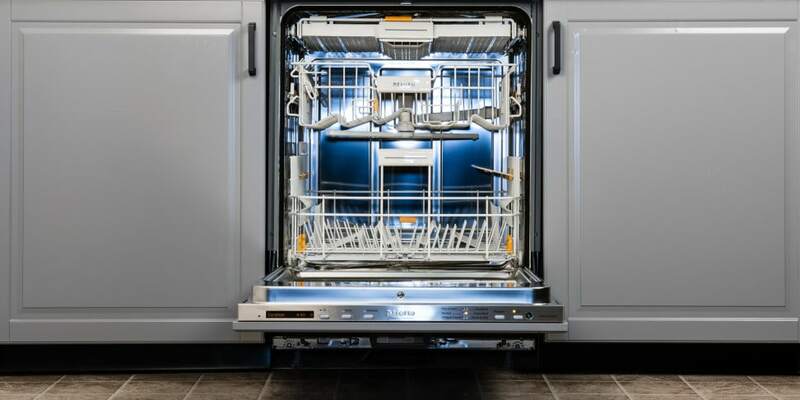 Whether you're tired of washing dishes by hand or are looking to save on water and electricity while getting your cutlery and tableware cleaner than ever, it's probably time to consider buying a new dishwasher. But don't rush out to the store just yet – first consider what options are best for your kitchen. Your standard dishwasher's length and width are both about 24 inches, which is typical counter depth and makes for easy installation. You can find larger and smaller sizes as well, so make sure to measure the space in which you plan to install the dishwasher first, to get an idea of what fits best in your kitchen. When shopping for a dishwasher, you may want to consider a fully-integrated model. This essentially means that the dishwasher is concealed by kitchen cabinetry. This is great for folks who like aesthetic symmetry in their kitchens. Your fully-integrated dishwasher will blend seamlessly into the rest of your cabinetry and, if you invest in a high-end model, it'll run so silently you'll hardly know it's there. One of the features of a fully-integrated dishwasher that can divide some buyers is the console. In the fully-integrated model, the controls are hidden in the top of the door. Full console dishwashers on the other hand are more traditional and feature their control panel in plain sight. Full console dishwashers can still be designed to blend with your cabinetry, however. Dishwashers often come with interior tubs made of either plastic or stainless steel. Most high-end models stick with stainless steel these days, as plastic tubs stain more easily. Stainless steel is more durable, and it also retains heat more efficiently than plastic, which actually means that your dishes dry more quickly. There are other dishwasher options out there as well, beyond standard models. Need to save on cabinetry space? Consider an 18-inch dishwasher that gives you extra storage in your kitchen. Another growing trend is investing in portable dishwashers, especially among homeowners and renters who don't want to or aren't able to install a permanent appliance. Portable dishwashers often have wheels, so they can be relocated to whatever water, drainage and electrical source you'd like to use to operate it, then rolled away again afterwards. You can get a portable dishwasher in a variety of sizes – even countertop models. When you're purchasing a dishwasher, consider specific model options that appeal to you. For instance, you may want a model with tines that fold down easily to allow for more space when you have stock pots or other large items that need cleaning. A sizable cutlery tray might be important to some shoppers, and others may want specific sanitizing settings on their washer. You may also want to invest in dishwasher from a European manufacturer. Many of these models use condensation drying, where the cooler stainless steel siding draws moisture away from the warmer dishes. Moving from traditional drying to condensation drying can be a major change for homeowners, as it requires them to look at dishwasher functionality differently. Although different, condensation drying is safer on plastic and melamine dinnerware, won't wear out dishes and doesn't create a baked-on crust over residual food. Condensation drying units also require the addition of rinse aid products. Of course, one of the biggest features that folks look for in modern dishwashers is energy efficiency. Not only can you save money on your utility bill with an eco-friendly dishwasher that saves on water and electricity, you can shrink your carbon footprint. Green shoppers should pay close attention to the efficiency ratings on the new dishwashers they're considering. Whether you've got space for a 30-inch fully integrated dishwasher for your spacious designer kitchen or just want a portable model to get you by in your apartment, there's a dishwasher out there for you.